If you have signs of damaged hair (dry, dull, brittle strands) the good news is healthy hair is in your control. Hair damage is something that’s done to your hair—not dictated by your DNA—so changing a few everyday habits will help restore it to a shinier, stronger, healthier state. Here, six hair-harming habits and how to minimize their impact. Using heat styling tools like a blow-dryer, flat iron or hot rollers daily can deteriorate your hair’s outside protective layer, known as the cuticle. This breakdown then allows moisture to escape and makes your strands more vulnerable to breakage. Applying a heat protectant product helps by acting as a temporary shield and standing in for your damaged cuticle. At Prose, we give hair extra protection from heat styling right in our hair care formulas with Wheat and Soy Amino Acids plus Arginine. Another way to minimize heat damage is to simply turn down the temperature on your tools. Most of us can achieve our desired style with an iron set between 360 and 400 degrees (rather than the max 450). And we can blow-dry 90 percent of our hair, especially all the underlayers, with a lower temperature setting, saving the hottest air for smoothing the top layer or shaping your ends or roots with a round brush. More than half of us color our hair on the regular and wouldn’t dream of stopping. And why should we? But the process of permanently changing your hair’s hue can be quite damaging because it lifts your strands’ outermost layer (the cuticle), diminishing your hair’s strength and allowing moisture to escape. (Yes, this result is very similar to the effects of frequent heat styling. So, if you color and heat style, it’s especially important that you heed these hair-protective how-tos). Your hair care regimen should work hard to replenish the lost moisture and reinforce a weakened cuticle. For color-treated hair, we will frequently include Silk Proteins to bolster damaged cuticles, as well as Oat Lipid and Sunflower Extract to replace any lost moisture. There was a time when we were told to brush our hair with 100 strokes before bed. That advice is dated (and damaging). Brushing your hair too much or too hard can cause breakage and initiate split ends. The worst time to take a brush to your head? Right after the shower, when your hair’s wet and likely a bit snarled. Taking a brush—especially a plastic one with those little balls at the ends of the bristles—is a recipe for strand-snapping. A safer strategy: Use a wide-tooth comb to work out any knots in damp hair. Then, use a boar-bristle brush (not a plastic one) to shape your strands as you blow-dry because soft bristles slide through wet hair without tearing. Finally, aim to brush your hair as little as possible once—no more than twice a day—it’s dry and styled. Towel-drying your hair is a good idea if it helps you cut down on blow-drying. But the act of rubbing your damp strands with a coarse, rough bath towel can cause split ends to travel up the hair shaft, and it may even create small holes along that hair shaft, weakening your hair. A simple solution: Switch out your towel for a t-shirt or microfiber towel, which help absorb excess water but aren’t abrasive. Also, try to gently squeeze, rather than rub, as you dry. Hair is made of a protein called keratin, and your strands must maintain a baseline amount of keratin in order to stay strong. To replenish lost keratin and keep your hair’s protein levels high, eating a diet packed with plenty of protein can help. The most common sources of protein are fish and lean meat, but if you’re not a meat eater, protein can also be found in nuts, seeds, soy, eggs, quinoa, and seitan. The scalp produces natural oils (a.k.a. sebum) to keep hair shiny and moist, but when you shampoo too much or use a shampoo that contains oil-stripping sulfates, this can remove too many natural oils from the scalp and cause hair to become dry, brittle and prone to breakage. In rarer cases, over-shampooing may also have the opposite (but equally unappealing) effect: By stripping the scalp of oil, you trick your oil glands into thinking they are under-producing sebum and thus cause the glands to start overproducing sebum. 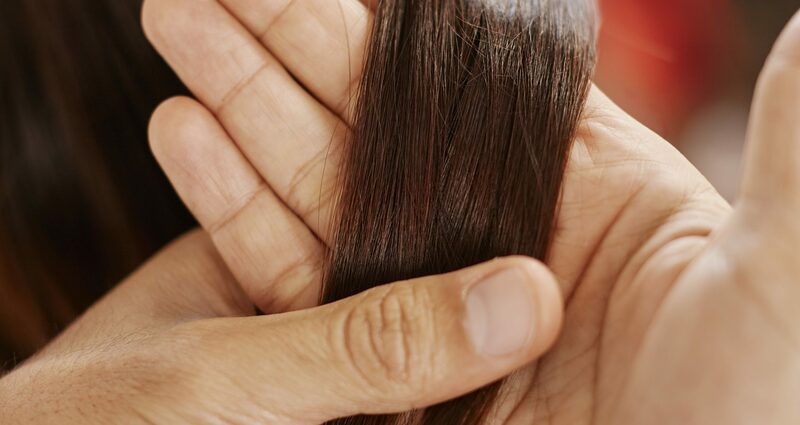 This can lead to an oily scalp and greasy hair. To treat either condition, it’s important to scale back on shampooing (no more than once a day, though every other day is even better) and choose formulas sans sulfates. At Prose, we also often infuse our shampoos with Spirulina and Dog Rose Fruits, which help balance sebum production on the scalp. Trying these tips will jumpstart your hair’s repair, but coupled with your own custom hair care regimen will further restore hair health. Get started here. Keeping your red hue from fading is easier than you think. The 2019 perm has loosened up and is a far cry from the coils of the past.